Following a successful trial in neighbouring Ealing, the distinctive hire bikes will be rolled out in phases across the Chiswick and Brentford area from February and will provide an alternative and convenient way to make short trips in and around the borough. The bikes feature an integrated ‘smart lock’ which allows them to be GPS tracked, as well as locking the back wheel when not being used. This means the expensive 'docking station' such as those needed for the Santander cycles is not needed, making them more suitable for use in outer London as there is no cost to the council for the scheme. To hire the bikes users download the Mobike app (Android , IOS), fill in their personal details, pay the £1 refundable deposit, and are ready to go. Journeys cost 50p per half hour. Deposits are refunded as soon as a user decides to leave the scheme. Throughout the trial we will be monitoring closely how the scheme is used. Users can communicate views on the trial with Mobike via their 24 hour contact centre on 0330 131 9789, if there are issues with bikes or their accounts they can be contacted via support.uk@mobike.com, or using the Mobike App. 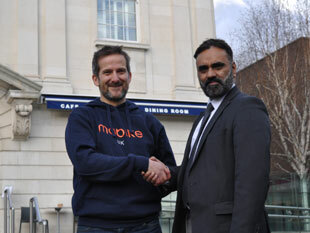 Mobike will be providing us with regular updates and feedback throughout the trial. We are particularly interested in ensuring that the bikes don’t lead to obstruction of the footway or take up cycle parking spaces used by existing cyclists, and will encourage people to report such incidences during the trial.